Pioneers in the industry, we offer wedding saree cover bags, fancy saree bag, saree cover bag and wedding saree cover bag from India. As we are a client-centric enterprise, we are engaged in manufacturing, exporting and supplying Fancy Gift Boxes such as Wedding Saree Cover Bags. Designed by our creative designers using quality tested basic materials and pioneering techniques in compliance with set industry norms, this gift box can be carried anywhere with ease. Highly applauded for the alluring and eye-catching look, the offered box is used for packing various products such as suits, sarees, cosmetics, chocolates, and cookies. Apart from that, our clients can easily avail this Fancy Gift Box from us at the pocket-friendly price. 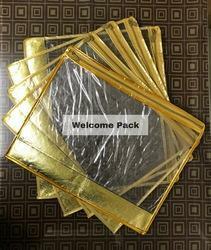 Size 42x35 cm (16 inch x 14 inch) Approx, Material High quality transparent material. Made with high quality transparent Pvc 10mm plastic material and zipper enclosure. Designer Single Packing saree cover In heavy quilted Printed Nonwoven material with Border Finish. This product will provide stylish look of your sarees. Welcome Packaging offers finest fashion accessories that incorporates contemporary designs and modern functions. Welcome Packaging brings products for every woman who dreams of being unique and stylish. It offers incredible range of handbags and jewellery boxes for women. Their products are incomparable in terms of quality.